The UNESCO World Heritage region of Hallstatt Dachstein Salzkammergut is graced with endless kilometers of hiking trails. Whether along romantic lakes or at dizzying heights - here every hiker will find the right offer and the appropriate tours for their very own personal fitness level. To ensure that you will not lose sight of the many hiking tours around Lake Hallstatt, the Dachstein plateau, in the Gosau valley or on the Zwieselalm, here follows a compilation of the most beautiful offers. We wish you a lot of fun while hiking in the Salzkammergut! 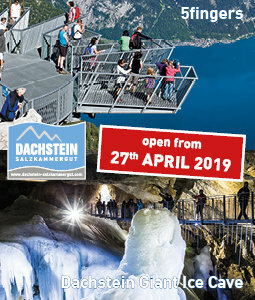 You will be spellbound by the magic world of the Dachstein and the other landmarks? Explore on numerous small romantic paths and trails or on comfortable and well developed hiking trails the most beautiful spots of Obertraun. Tree thousand metre-high mountain tops, gentle crests, smooth hilltops, wide plateaus and mountains of all sizes. No matter what direction you look in Hallstatt, towering peaks are feature of the landscape everywhere. The historical “Soleweg” (brine trail) is widely known as one of Austria’s most beautiful trails an other trails. The Goisern mountain hut and the Kalmberg are among the most beautiful destinations for those hiking in the Bad Goisern area. Traunreiter path: One of the most beautiful hiking paths in Bad Goisern, is close to the River Traun - the Traunreiterweg! Here you will find an overview of all hiking tours in and around the Lake Hallstatt area, at a glance. From the high alpine hikes to leisurely tours in the valley. High-altitude hikes for everyone. Hiking with unlimited distant views and strong challenges. Whether one-day or multi-day hiking. Mountain adventure at its finest. 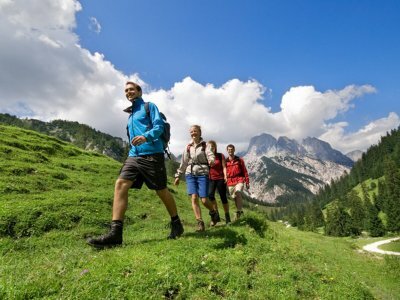 The Trail gives hikers an opportunity to experience the natural beauty of the Dachstein-Salzkammergut-region, as well as to learn more about the mineralogy and geology of Hallstatt, Gosau, Bad Goisern and Obertraun. The focus was on making everything easy to understand, enjoyable and hands-on. A hiking tour like no other. As you walk around the Hohen Sarstein, situated between the Aussee region and the Inner Salzkammergut, there are thousands of years of history to be experienced. The route is 45.5 km long and is sign-posted throughout. There are many points of interest along the way. Tranquillity, as you have never experienced it before. Get up early in the morning, before sunrise and stand in front of the hut and be immediately surrounded by the unspoilt nature of the UNESCO World Heritage region of Hallstatt Dachstein Salzkammergut. Birds sing the first song of the day. Cowbells ringing in the distance, enjoy your morning coffee on the hut bench while tasting the fresh air - that's what people from all over the world find fascinating about a magical overnight stay in a hut in the holiday region of Dachstein Salzkammergut. Relax your eyes and gaze into the distance, forget everyday life, soak up the rays of the sun, feel the wind on your skin and just unwind. So have we filled you with desire? What are your criteria for a hut night? For Dachstein Hikers:: Ten commandments for Dachstein Hikers at the high-alpine region.